Services are scheduled for 9:30 a.m. Tuesday, April 3, at Our Lady of Grace Catholic Church for Senaida Machuca Martinez of Artesia. 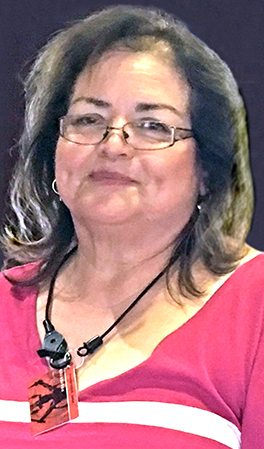 Martinez, 65, passed away Saturday, March 24, 2018, at her home. Fr. Vijay will officiate the services, with interment to follow at Woodbine Cemetery. Pallbearers will be Andres Machuca III, Chuyito Machuca Jr., David Villafranca, Orlando Cabezuela, Mundo Gonzales Jr. and Carlos Gonzales. Honorary pallbearers are Andres Machuca Jr., Jesus Machuca, Raul Lerma, Lupe Villafranca, Domingo Lerma, Lupe Lerma, Junior “Chango” Martinez, Juan Martinez, and all other nieces and nephews. Visitation will be held from 10 a.m. – 4 p.m. Monday, April 2, at Terpening & Son Mortuary. A rosary will be recited at 6:30 p.m. Monday at Our Lady of Grace. Senaida was born March 1, 1953, in Ruidosa, Texas, the daughter of Andres Cano and Albecia (Cabezuela) Machuca. On May 8, 1982, she married Ysidro Martinez in El Paso, Texas, and the couple came to Artesia in 1982. Senaida was a seamstress and worked for Levi Strauss Company. She was a member of Our Lady of Grace Catholic Church and Apostalado. She enjoyed cooking and working out in her yard. Senaida loved riding the Senior Center bus for trips, was an assistant cook at Head Start, helped those in need, and always had time for her grandchildren. Survivors include her husband, Ysidro Martinez, of Artesia; sons Fernando Machuca Martinez and wife Lili Beth, and Jorge Luis Machuca Martinez, both of Artesia; brothers Jesus Machuca and Andres Machuca, both of El Paso, Raul Lerma and Domingo Lerma, both of Odessa, Texas, and Lupe Lerma of Temecula, Calif.; sisters Ofelia Gonzales of El Paso, Magdalena Villafranca of Crowley, Texas, Rosario Cabezuela of Artesia, and Dolores Chavez of DeSoto, Texas; and grandsons Cesar Fernando Martinez and Adriel Ysidro Martinez.